Framed for Murder and on the run, Detective Inspector Cass Jones gets unwelcome attention wherever he goes, including being hounded by his former colleagues. As he works desperately to save his kidnapped nephew and gain answers he finds himself going up against The Bank and its sinister employees one last time. As Strain II takes a hold of the city it becomes clear that everything hinges on finding Luke. 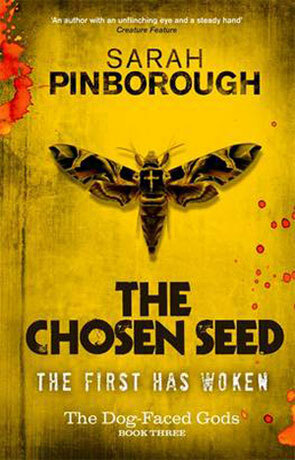 The Chosen Seed is the final episode in the Dog-Faced Gods series and follows on from the events of "A Matter Of Blood" and "The Shadow of the Soul", if you haven't read these then it's best to do so before even attempting this book as there is no hand-holding or time taken recounting the previous events - the novel hit's the ground running and doesn't let up for the whole duration. The author does a great job of bringing together the different strands of the story to create a fitting end to the series and we get to understand a great deal more about the enigmatic enemies and just what the stakes are in this game. The ending is pretty spectacular and Pinborough does a great job of building the tension to that climax. The quality of the prose is excellent and the novel is just so easy to read. I loved the style of horror blended with police procedural and supernatural scifi which creates a totally unique atmosphere. The cast of characters is great, each and every one fleshed out and brought to vivid life, I loved that the antagonists get just as much attention to detail than the protagonists - something that is often overlooked. The story itself is superb, with high octane white-knuckle thrills alongside horror, plenty of backstabbing and lots of unexpected twists that leave you almost breathless. A powerful ending to a rewarding series, if you haven't read the first two novels then read them then read this, it's well worth your time and hard earned cash. Written on 21st March 2012 by Ant.